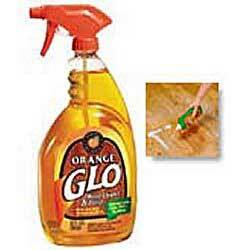 Orange Glo® Wood Floor Polish & Cleaner Gently clean, polish and protect your hardwood floors in one easy application. Use OrangeGlo® Wood Floor Polish & Cleaner: · On laminate or hardwood floors... · To repel dust, and protect against moisture... · To remove dirt, grime, waxy buildup and scuff marks. Made with citrus oils, Orange Glo restores wood to its natural luster, leaving a non-slip shine, and refreshing scent.